This property offers a quiet peaceful setting where you can still see the stars at night, pasture your cattle, grow an orchard, and ride your horses in the adjacent river. Residential Horse Property, Bed & Breakfast, Potential Aggregate, Irrigated Farmland, Nursery, Trail Ride Service and other Agriculture uses. ¼ mile north of Lower Buckeye on the east side of 331st Avenue Tonopah, Maricopa Co.
1,352 SF Residence built ‘79, 1,440 SF Shop, Tack Barn, Horse Stalls, irrigation lines, mature citrus, property fenced. $330,000 - Cash, please submit all offers. This property has the beginnings of a retreat. As you pull into the drive, the white fence and entry invite you in to the many potential opportunities. The original house was built in the late 1970’s, a quaint farm house of 1,352 S.F. provides for simple and rustic 3 bedroom 2 bath accommodations. Enjoy the winter evenings by the red brick fireplace or the beautiful spring and fall evenings on the porch. The 1,440 s.f. shop building was built in the early 80’s and serves the basic needs. The tack shed and stalls provide utility for horse and cattle uses. Additional buildings include shade, detached garage/storage building, manufactured single wide home. 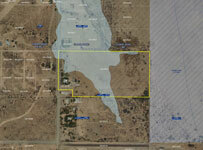 This property is developed into sprinkler irrigated cropland, and also has the potential for sand or gravel operation due to location near the river. Property includes irrigated grandfathered water rights, which allows for irrigation of the properties 16+ acres that are laid out for sprinkler irrigation. The area around the buildings is well cared for with mature citrus, mature fig and grassy areas. For those that love to get away from it all, the Hassayampa river is located directly east of the property and is an ideal resource for trail rides of all types. The property has access and frontage on gravel 331st Avenue. The property is located approximately 10 minutes west of downtown Buckeye. Take the main thoroughfare Baseline Road west from Buckeye, turn north on 339th Avenue, travel north to Lower Buckeye Road, then east to 331st Avenue, turn north and property is approximately ¼ mile on the east side.